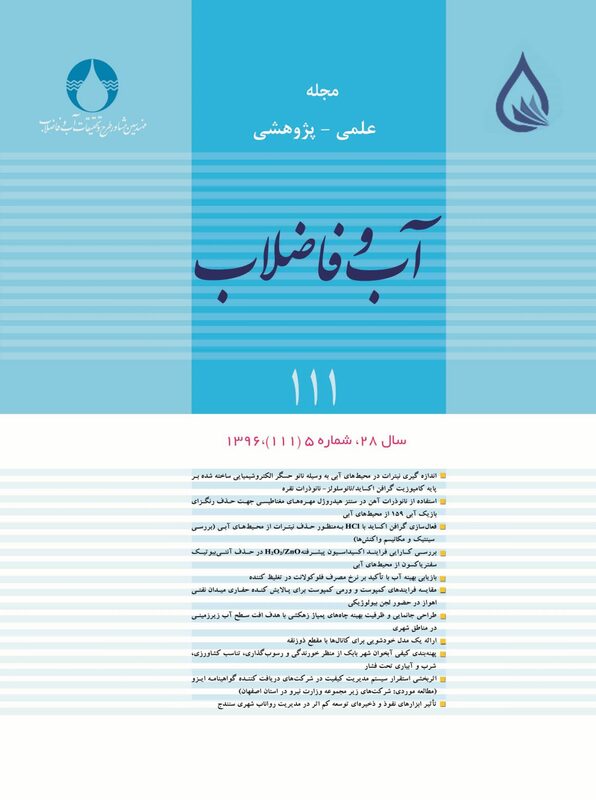 در سال‌های اخیر توسعه کم اثر به‌عنوان روشی شناخته شده، بهترین و مقرون به صرفه‌ترین راه حل را در مدیریت و کاهش اثرات منفی سیلاب شهری ارائه نموده است. این روشِ کاربردی با بهره‌گیری از ابزارهای دوستدار محیط زیست، گامی مؤثر در توسعه پایدار بوده و اثرات شهرنشینی بر سطوح نفوذناپذیر را کاهش داده و در تغذیه و نفوذ آب‌های زیرزمینی مؤثر است. هرچند که ظهور ابزارهای توسعه کم اثر در مدیریت آبهای سطحی و حفظ کیفیت آن بسیار مؤثر است، ولی جانمایی این تجهیزات و استفاده بهینه از هر یک متناسب با شرایط محیطی در حال تغییر است. در تحقیق حاضر با استفاده از ابزارهای سلول نگهداشت ذخیره، بشکه باران، بام سبز، جوی‌باغچه و اعمال سناریوهای مختلف بارشی در دوره‌های بازگشت 2 تا 100 ساله شهر سنندج مستخرج شده از داده‌های آماری به مقایسه و اندازه‌گیری میزان حجم و نوع رواناب در هر زیرحوضه در دو دوره زمانی قبل و بعد از توسعه پرداخته شد. برای مدل‌سازی هیدرولیکی و هیدرولوژیکی حوضه یادشده از نرم‌افزار SWMM 5.1 آژانس حفاظت محیط‌زیست آمریکا استفاده شد و با اعمال ابزارهای توسعه، میزان تغییرات پایش شد. از مهم‌ترین نتایج این پژوهش می‌توان به تغییر شکل هیدروگراف، کاهش 50 درصدی زمان تمرکز و کاهش 35 تا 50 درصدی دبی اوج با استفاده از روش‌های توسعه کم اثر در شهر سنندج اشاره کرد. به‌طور کلی با طبقه‌بندی تجهیزات به ابزارهای نفوذ و ذخیره‌ای در کنترل روانابهای شهری می‌توان بهترین الگو را برای بازگشت به شرایط پیش از توسعه و یا حتی مدیریت سیلاب در نواحی خطرپذیر شهری انتخاب کرد. In recent years, low-impact development (LID) has been well established as a method to provide the best and most affordable solutions for managing and alleviating the negative impacts of urban floods. Application of this practical method is regarded as a major step toward sustainable development as it employs eco-friendly storage instruments, reduces the effects of urbanization on impervious surfaces, and helps water infiltration to recharge groundwater resuorces. Although low-impact development tools have proved effective in the management of surface water resources and conservation of water quality, finding proper locations for the deployment of the equipment and the optimal use of each tool are still questions of much controversy and no definitive solutions are provided yet as environmental conditions keep changing. The present study exploits bio-retention cells, rain barrels, green roofs, and vegetable swales as storage instruments under different rainfall scenarios with return periods from 2 to 100 years extracted from the statistical data of Sanadaj City to determine the flood volumes and hydrographs for each sub-basin before and after the low-impact development tools are employed. Moreover, SWMM 5.1 software developed by the American Environmental Protection Agency is used to develop hydraulic and hydrologic models of the basin and the changes are monitored with each development tool selected. The most outstanding results obtained from this study include the change observed in thet form of hydrograph, a reduction of 50% in time of concentration, and reductions of 35 to 50% in peak flow in the city of Sanadaj as a result of employing the low-impact development method. Conclusion: Classification of the equipment into infiltration and storage tools used for urban runoff control allows the best runoff control model to be developed such that the grounds are prepared not only for the return to the conditions before a certain development took place but even for flood management in challenging and riskful urban areas. Ahiablame, L. M., Engel, B. A. & Chaubey, I., 2012, “Effectiveness of low impact development practices: Literature review and suggestions for future research", Water, Air, and Soil Pollution, 223(7), 4253-4273. Booth, D. B., Hartley, D. & Jackson, R., 2002, Forest cover, impervious‐surface area, and the mitigation of stormwater impacts, Wiley Online Library. Coffman, L., Clar, M. & Weinstein, N., 2000, "Low impact developmpent management strategies for wet weathe flow (WWF)", Control Building Partnership, doi: 10.1061/40517 (2000) 109. Herricks, E., 1995, Stormwater runoff and receiving systems: Impact, monitoring, and assessment, CRC Press, USA. Hsu, M.-H., Chen, S. H. & Chang, T.-J., 2000, "Inundation simulation for urban drainage basin with storm sewer system", Journal of Hydrology, 234(1), 21-37. Jang, S., Cho, M., Yoon, J., Yoon, Y., Kim, S., Kim, G., Kim, L. & Aksoy, H., 2007, "Using SWMM as a tool for hydrologic impact assessment", Desalination, 212(1), 344-356. Jia, H., Lu, Y., Shaw, L. Y. & Chen, Y., 2012, "Planning of LID–BMPs for urban runoff control: The case of Beijing Olympic Village", Separation and Purification Technology, 84, 112-119. Jia, H., Yao, H., and Shaw, L. Y., 2013, "Advances in LID BMPs research and practice for urban runoff control in China", Frontiers of Environmental Science and Engineering, 7(5), 709-720. Martin-Mikle, C. J., de Beurs, K. M., Julian, J. P. & Mayer, P. M., 2015, "Identifying priority sites for low impact development (LID) in a mixed-use watershed", Landscape and Urban Planning, 140, 29-41. Miller, J. D., Kim, H., Kjeldsen, T. R., Packman, J., Grebby, S. & Dearden, R., 2014, "Assessing the impact of urbanization on storm runoff in a peri-urban catchment using historical change in impervious cover", Journal of Hydrology, 515, 59-70. Putnam, A. L., 1972, Effect of urban development on floods in the Piedmont Province of North Carolina, Open-File Report, USA. Sauer, V. B., Thomas, Jr., W., Stricker, V. & Wilson, K., 1983, Flood characteristics of urban watersheds in the United States, USGPO Report, USA. Shuster, W., Bonta, J., Thurston, H., Warnemuende, E. & Smith, D., 2005, "Impacts of impervious surface on watershed hydrology: A review", Urban Water Journal,2(4), 263-275. Sin, J., Jun, C., Zhu, J. & Yoo, C., 2014, "Evaluation of flood runoff reduction effect of LID (Low Impact Development) based on the decrease in CN: Case studies from Gimcheon Pyeonghwa district, Korea", Procedia Engineering, 70, 1531-1538. USEPA., 2002, National water quality inventory 2000 report, EPA-841-R-02-001. Woods-Ballard, B., Kellagher, R., Martin, P., Jefferies, C., Bray, R. & Shaffer, P., 2007, The SUDS manual, Ciria London. Zhang, G., Hamlett, J. M. & Saravanapavan, T., 2010, "Representation of low impact development scenarios in SWMM", Dynamic Modeling of Urban Water Systems, Monograph, 18, 183-189.